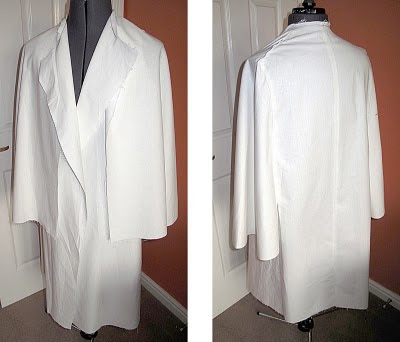 The following entry is one I wrote back in early November last year when I was cutting the pattern on the cape. Now I have cut what is known as a Block for the Inverness Cape, (see right) I now need to work it up into a usable pattern. This is relatively easy to do, with the right tools, and a bit of careful thought. The pattern is made by laying a sheet of tracing pattern paper over the block and tracing out and thus separating each of the three main shapes. The block is drawn to the net size, that is to say the finished sewn size, so does not take into account seam allowances, which I need to add. 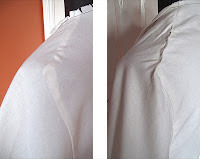 First I have traced the back panel (see left). I do this using a special tool I have been introduced to at my college course: a seam grader. This is (a rather expensive) piece of plastic, which has two straight edges at right angles, and some French curve shapes opposite, including some internal ones (see below). 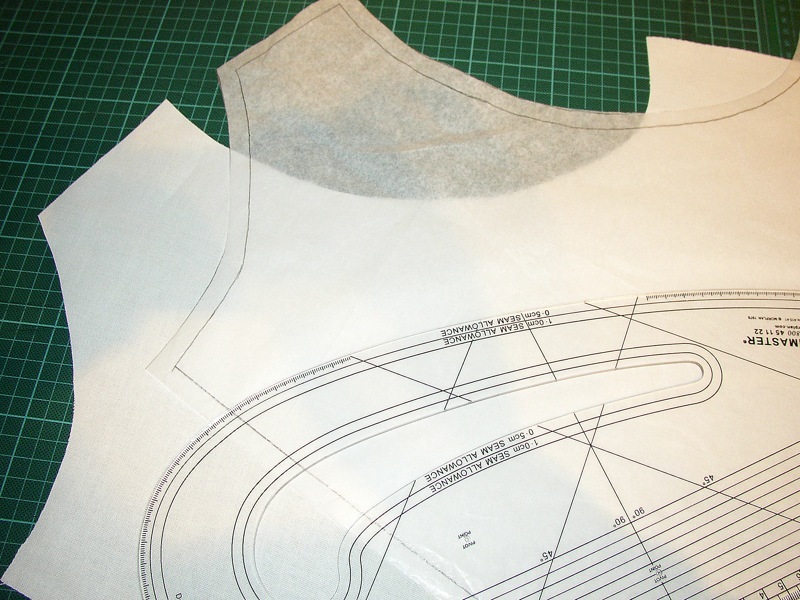 These can be used to shape the curved lines needed for the pattern, such as around the collar, quickly and easily. 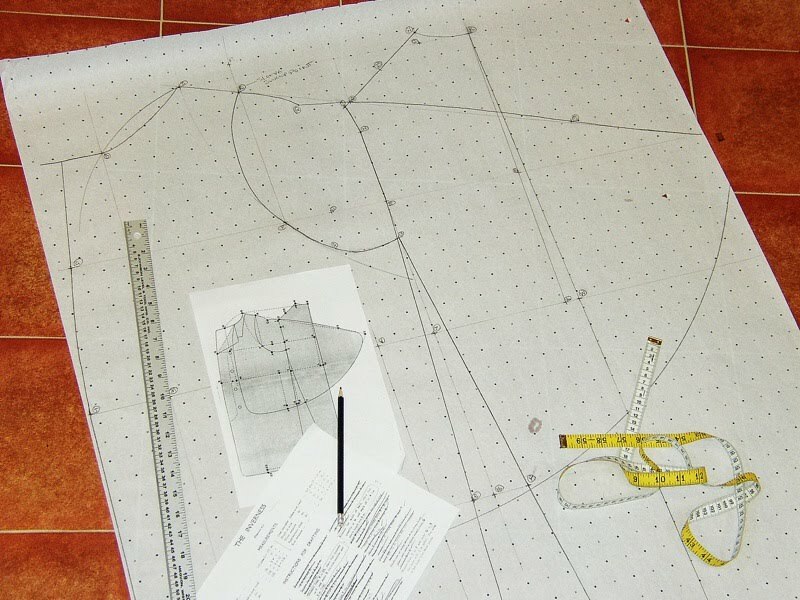 As well as helping to shape the pattern, the grader has 5mm and 10mm parallel lines running along all its edges, which you then line up with the lines of the pattern you have drawn. You can then mark, consistently and with ease, as suitable seam allowance around all sides of your pattern. Having used it at college I instantly saw its significance and soon acquired one for myself and now swear by it! 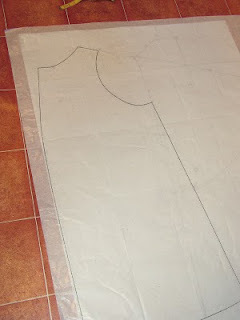 So now I have my three basic pattern shapes, I can cut the pattern out of the tracing paper and I am ready to make my first calico test. Assembly of this is simple, though I find there are a couple of ticks I need to watch for when I make it for real. The test goes well, but I quickly find that the armhole allowance is woefully inadequate, so need to make a substantial alteration here (see left), which needs to be fed back to the master pattern. When things like this happen, it only goes to highlight the benefits and importance of doing a test in cheap fabric like this. Finding out a fundamental fit problem when I was assembling the final cape would have been a disaster! Otherwise the fit is very good, though I need to do something with the shoulder area, as this is coming to an unnatural point! (see right) Nicola, my tutor, gives me some suggestions for that. 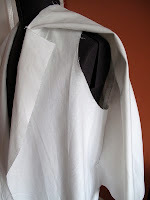 I now feel it is time to embellish the pattern, and create the pieces necessary to make it for real.